Summer months are supposed to be filled with fun summer clothes and trips to the beach. With a body full of acne though, who wants to expose that much skin? Acne typically creeps up on the face where make-up can easily be applied. Acne on other areas, however, isn’t as easy to cover. With a few helpful tips, anyone suffering from this dreadful skin condition can get their body back and enjoy the summer the way they want to. Hormonal changes within the body are the main culprit for these tiny pustules forming under the skin. Only small zits grow on the face, because smaller pores are present. The body contains larger pores, which means big, obnoxious pimples can grow on all areas. The only two places you can’t get zits? The hands and feet. This is because there are no sebaceous glands in these areas. All other body parts are fair game. Hormonal changes may play a big role in developing acne, but it isn’t the only possible culprit. Diet can play a role as well, as can having clogged pores. Sweat, rubbing clothes and unwashed sheets can all contribute too. 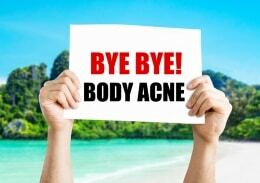 Numerous ways are available for you to get rid of the acne your despise. Not all methods may work, but they’re definitely worth a try if it means enjoying a backless dress or a trip to the pool without worrying about the giant pimples sitting on your skin for everyone to see. One method includes using a body acne kit. The Exposed Skin Care Body Acne Kit includes everything you need to eliminate acne. Body wash, treatment serum and an exfoliating body cloth are included. The body wash helps keep your skin clean and oil free. It contains sage extract, pro vitamin B5 and salicylic acid. This wash clears your pores, regulates oil production and even detoxifies the skin. The microbeads provide an even clean and it won’t dry out your skin like many average body washes do. The serum works to kill bacteria that causes acne. It’s made of benzoyl peroxide, tea tree oil and even green tea extract. Together, these ingredients help prevent breakouts and promote healing of the skin. It works well when placed directly on blemishes and almost acts as a spot remover. The body cloth is one of the most important components of this kit. The skin is often contaminated with oils, dirt and bacteria. This can easily cause blemishes to form and larger pustules to grow. By using the cloth to exfoliate the skin, these harmful bacteria and other grime can be eliminated. This will reduce the chance of pimples forming on the skin. Cells within the skin will grow and heal quicker when exfoliated in this way. It will also even out your skin tone and make your skin visibly smoother. While this treatment may seem like a miracle worker, there are some things to consider. There are many positive aspects to this treatment, but there are also a couple possible downsides that you should know about. The first is in regards to the treatment serum. The serum can be pretty harsh on skin, so it should never be applied to skin that is clear of pimples. Only skin found with blemishes should be treated with the product. Also, if you have extra dry skin, the body wash may dry you out a little more. Exposed Skin Care offers this body acne kit for a reasonable price. 60 days worth of product is included, allowing you plenty of time to make your acne disappear. A one-year guarantee is even offered, stating that if you don’t see results, you can get your money back. The brand also features a “Clear Skin in 30 Days” guarantee, making it even more tempting to try. If you’re tired of body acne stopping you from enjoying your summer, this body kit is worth a try.